Rally Mexico this year will be remembered for two main things. The first is Citroen fighting back after their disappointing opening round in Sweden to prove that their new DS3 is just as competitive as the Ford Fiesta. Unfortunately for Citroen, despite their overall strong showing in terms of speed, the other thing this rally will be remembered for is the straight fight between Loab and Ogier on the final day which lead to Ogier pushing too hard when under pressure and crashing out of the event. It was overall a good event but it ended up being a bitterly sweet one for Citroen. Of course, they still won the event with Loeb but it was a shallow victory. Ogier threw away his superior speed for most of the weekend with one small but very costly error, and that allowed Ford to capitalise by taking a double podium in an event where they should have been lucky to get one driver into the top three. Ken Block had a variety of issues, starting with electrical problems with his car barely after the car had left the ceremonial start before the first street stage tyo begin the rally. It was a bitter blow for his as he has considerable experience on this rally. It’s also one of his favourite events and had he not suffered with so much time-loss through problems he might have been able to challenge for some good points. His wasn’t the only Fiesta to suffer reliability problems but luckily it didn’t hamper the two works drivers, Hikko and Jari-Matti. Petter Solberg showed strong pace on day two which helped him climb back up to fifth in the standings heading into the final day. 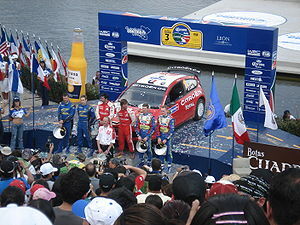 He was gifted fourth due to Ogier’s mistake. 5th and 4th in the first two rallies is not a bad start for Petter in his privateer DS3. Of course, he’s looking for wins and podiums but it’s impressive when you consider that he’s been beset with a variety of problems in both events including having his co-driver finish the final stage behind the wheel in Sweden, as well as engine problems and a half-broken gear level in Mexico. When he gets the car working 100% for him then I don’t think many people would bet against consistent podiums for him throughout the season. I really hope he gets a win this year. It’s been way too long for someone of his immense talent. I’m really excited for Portugal as it will be the first rally of the year in conditions which are fairly typical, with no altitude sapping the engines, and a surface that doesn’t generally favour any particular drivers. I’m equally excited about the soon to be confirmed WRC entry for Volkswagon. I can’t wait to see their plans, and I assume Nasser Al-Attiyah will be a part of them. Being confirmed as a driver for the new team would certainly go a long way to helping him forget about being robbed of his first SWRC win in Mexico over a simple technicality. I have no idea what car they’ll be entering but whatever it is, they’re likely to be pushing Citroen and Ford from the get-go which is really exciting. Hopefully Mini have the same impact too. Due to ESPN having a free weekend during the Mexico Rally, I got to see the live power stage for the first time. At first, I wasn’t sure about the idea of giving bonus points for the final live stage, but now I love the concept. If there had been no bonus points available, we would have seen careful driving from pretty much all of the drivers. We saw this in the opening two stages of the final day. Because of the change, the top drivers may still play it relatively cautiously, but they have to make sure to do enough to at least stay ahead of the drivers charging behind them. The drivers who are out of contention for the higher points giving places can drive to the maximum which is great to see. Petter Solberg was saving his tyres for the power stage, as was his brother Henning among others. It’s a great risk / reward system that will continue to cause the leading drivers to make tough decisions at every event. I also thought that I would miss the hydraulic gear shifters in the old cars, but I actually am enjoying the new cars in their simplicity. They are designed to be more reliable and reduce costs to attract more manufacturers, all without diminishing the speed or excitement. I think WRC have done a great job on all fronts, which is fantastic news.